Generally, real systems are nonlinear. 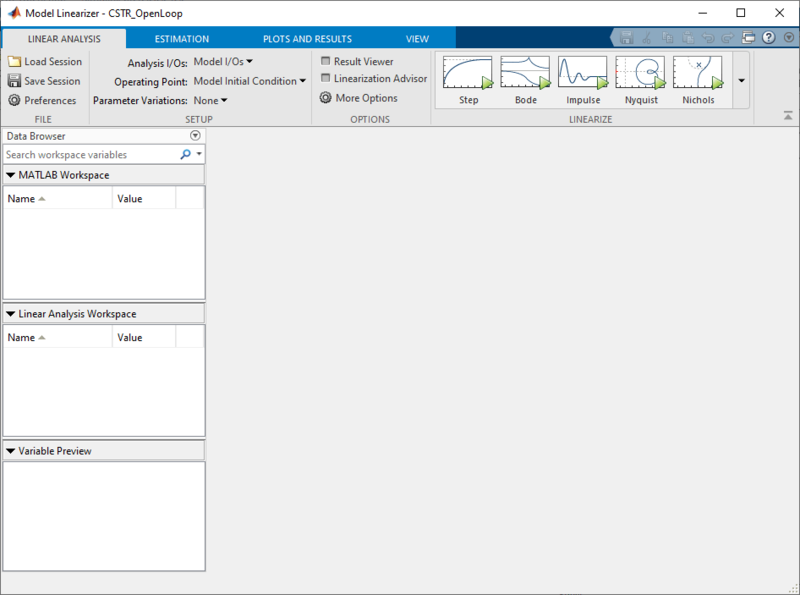 To design an MPC controller for a nonlinear system, you must model the plant in Simulink®. Although an MPC controller can regulate a nonlinear plant, the model used within the controller must be linear. In other words, the controller employs a linear approximation of the nonlinear plant. The accuracy of this approximation significantly affects controller performance. To obtain such a linear approximation, you linearize the nonlinear plant at a specified operating point. Simulink Control Design™ software must be installed to linearize nonlinear Simulink models. Using the Linear Analysis Tool. This example shows how to obtain a linear model of a plant using a MATLAB script. For this example the CSTR model, CSTR_OpenLoop, is linearized. The model inputs are the coolant temperature (manipulated variable of the MPC controller), limiting reactant concentration in the feed stream, and feed temperature. The model states are the temperature and concentration of the limiting reactant in the product stream. Both states are measured and used for feedback control. 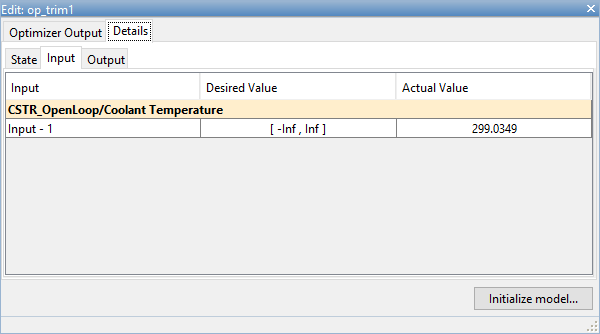 The operating point defines the nominal conditions at which you linearize a model. It is usually a steady-state condition. Suppose that you plan to operate the CSTR with the output concentration, C_A, at 2kmol/m3. The nominal feed concentration is 10kmol/m3, and the nominal feed temperature is 300 K. Create an operating point specification object to define the steady-state conditions. Operating point search report for the Model CSTR_OpenLoop. The calculated operating point is C_A = 2kmol/m3 and T_K = 373 K. Notice that the steady-state coolant temperature is also given as 299 K, which is the nominal value of the manipulated variable of the MPC controller. If the linearization input and output signals are already defined in the model, as in CSTR_OpenLoop, then use the following to obtain the signal set. Otherwise, specify the input and output signals as shown here. Linearize the model using the specified operating point, op1, and input/output signals, io. This example shows how to linearize a Simulink model using the Linear Analysis Tool, provided by the Simulink Control Design product. This example uses the CSTR model, CSTR_OpenLoop. 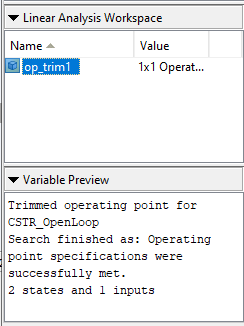 The linearization inputs and outputs are already specified for CSTR_OpenLoop. The input signals correspond to the outputs from the Feed Concentration, Feed Temperature, and Coolant Temperature blocks. 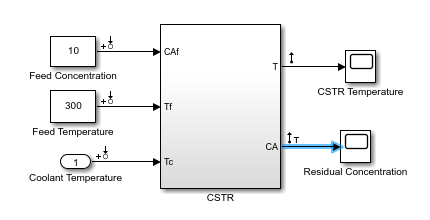 The output signals are the inputs to the CSTR Temperature and Residual Concentration blocks. Linearization input, right-click the signal in the Simulink model window and select Linear Analysis Points > Input Perturbation. 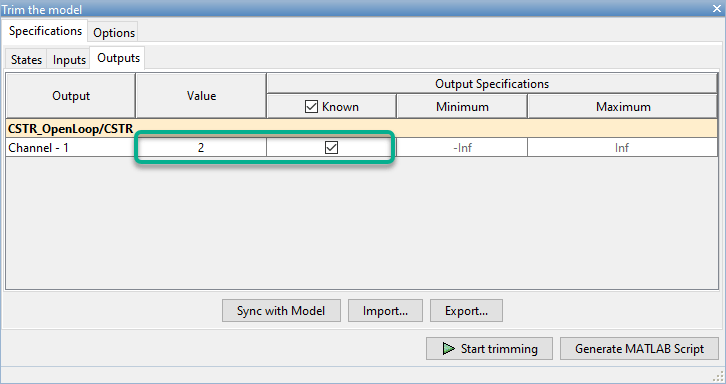 Linearization output, right-click the signal in the Simulink model window and select Linear Analysis Points > Output Measurement. In the Simulink model window, right-click the CA output signal from the CSTR block. Select Linear Analysis Points > Trim Output Constraint. In the Linear Analysis Tool, in the Linear Analysis tab, in the Operating Point drop-down list, select Trim model. Select the Known check box for Channel - 1 under CSTR_OpenLoop/CSTR. Set the corresponding Value to 2 kmol/m3. In the Trim the model dialog box, click Start trimming. The operating point op_trim1 displays in the Linear Analysis Workspace. Double click op_trim1 to view the resulting operating point. In the Edit dialog box, select the Input tab. The coolant temperature at steady state is 299 K, as desired. In the Linear Analysis tab, in the Operating Point drop-down list, select op_trim1. Click Step to linearize the model. 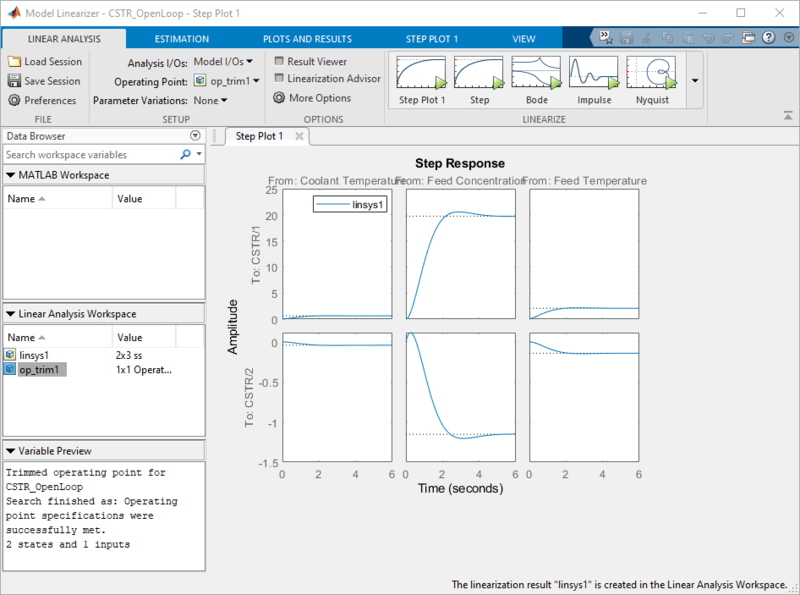 This option creates the linear model linsys1 in the Linear Analysis Workspace and generates a step response for this model. linsys1 uses optrim1 as its operating point. The step response from feed concentration to output CSTR/2 displays an interesting inverse response. An examination of the linear model shows that CSTR/2 is the residual CSTR concentration, C_A. When the feed concentration increases, C_A increases initially because more reactant is entering, which increases the reaction rate. This rate increase results in a higher reactor temperature (output CSTR/1), which further increases the reaction rate and C_A decreases dramatically. If necessary, you can repeat any of these steps to improve your model performance. 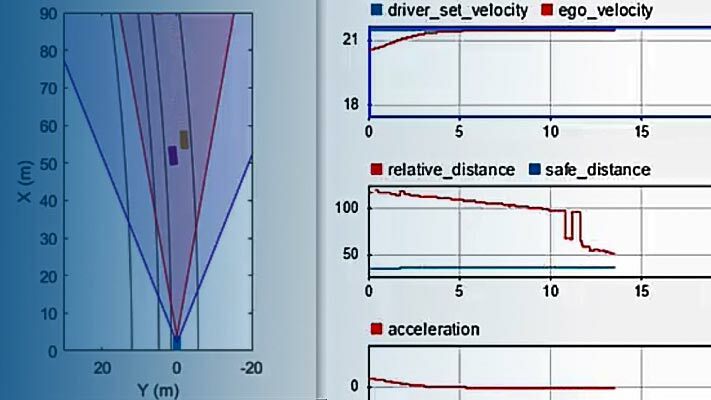 Once you are satisfied with your linearization result, in the Linear Analysis Tool, drag and drop it from the Linear Analysis Workspace to the MATLAB Workspace. You can now use your linear model to design an MPC controller.